Have you ever dreamed of making an almond croissant from scratch? But have been too intimidated to even try? Well, you’ve come to the right place! I’ve broken it all down for you with labeled step-by-step photos and easy to follow instructions. If you want to try a sweeter spin on the classic croissant, give our Nutella croissants a try! This recipe was originally posted on Feb 26, 2016, we’ve tweaked it a bit since then. This post has Amazon affiliate links for tools we used to make this recipe. These buttery and flaky almond croissants are made from scratch, including the almond paste inside each pastry. After the croissants are rolled up (and NOT proofed yet), place them in a single layer on a baking sheet lined with parchment paper. Freeze until solid (about 3 hours). Then transfer them to a ziplock bag. That way, when the croissants are removed from the freezer, they thaw and proof altogether. Give the croissants at least 8 hours to proof at room temperature before putting them in the oven. Oven temperature should remain the same as baking them unfrozen. Making croissants is not difficult; you don’t need any expensive ingredients or equipment. All you need is time and technique. They do take quite some time and patience, but the end result is so worth it! You just can’t compare homemade croissants to store bought ones. You might ALSO ENJOY trying my Nutella croissants. And if you love anything with an almond-like filling, this almond pear tart and raspberry almond tart is a MUST! 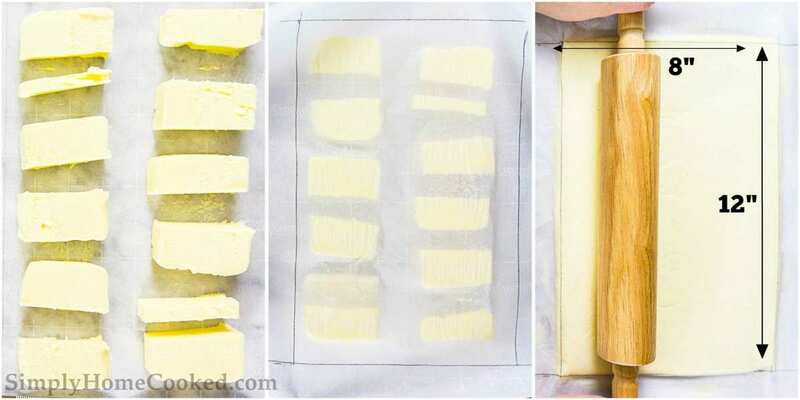 Place softened butter onto a sheet of parchment paper, place another sheet on top. Using a rolling pin compress the butter into a slab 8 inches by 12 inches. Then place in the refrigerator to harden. 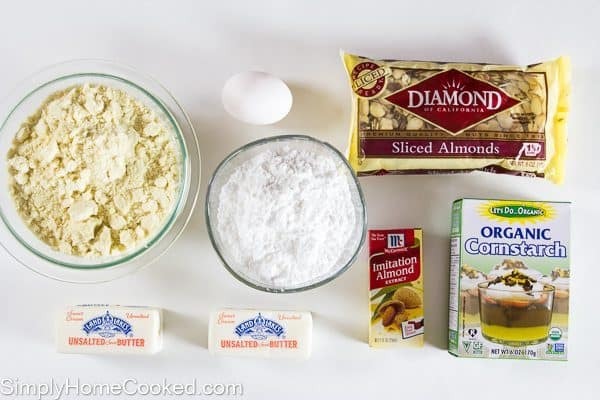 Combine 1 egg, softened butter, and almond extract. Then blend in the almond flour, powdered sugar, and cornstarch. Combine the water and yeast in a measuring cup and place it in a warm place for 10-15 minutes. Then place the flour, sugar, and salt in the bowl of a stand mixer. Add the yeast mixture in and combine using the hook attachment. Once the dough takes shape, add softened butter. 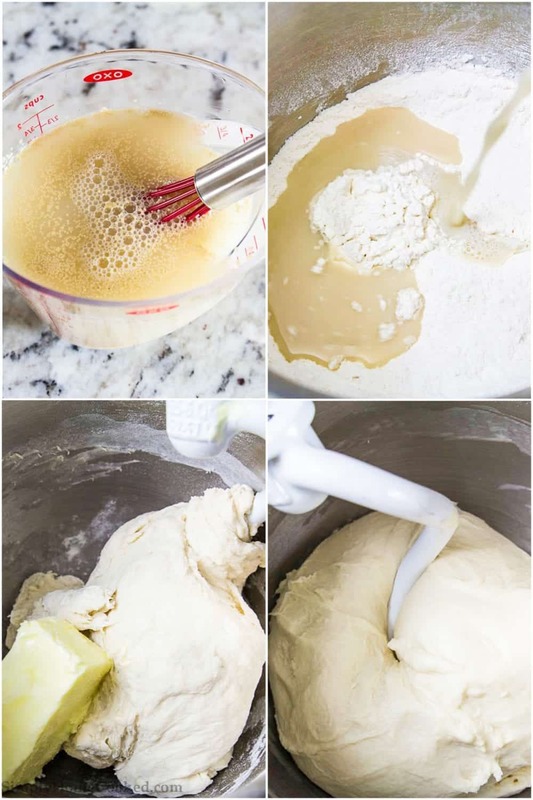 Continue mixing until the croissant dough is smooth and elastic. Transfer the dough to a greased bowl, cover with plastic wrap and let it double in size for about 2 hours. Once the croissant dough is done rising, deflate it onto a floured surface and roll it out to a rectangle 28×14 inches. Then fold 2/3 of the left corner and bring the edges together just so they touch. Starting from the shorter edge fold the dough into thirds. At this point, the dimensions of the folded dough should be about 6 x 12 inches. Cover with plastic wrap and refrigerate for 6-8 hours (or overnight). Using your hands, deflate the dough. Then roll it out to a 25x9in rectangle. Place the cold butter slab on the right half of the dough but leave a 1-inch margin around the edges. Fold the left half (unbuttered side) over. Using a rolling pin, press down on top of the dough to help disperse the butter evenly. After that, roll the dough out to a 30×12 inch rectangle. Fold over 2/3 of the left corner then bring in the right corner so both edges touch. 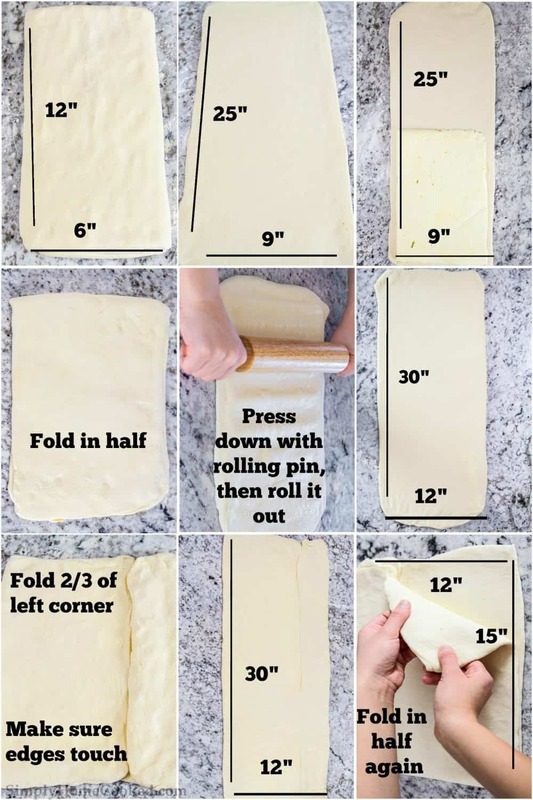 Roll the dough out to a 30×12 inch rectangle. Fold it in half like a book. After its folded the dimensions should be 15 x 12 inches. Roll it out to 30 x 12 again. Then fold it into thirds. The size of the dough should be 12 x 8 inches. Cover with plastic wrap and refrigerate for 30 minutes. Remove from the refrigerator and cut in half. Rewrap one of the halves and place it in the fridge while you work on the other half. Finally, roll it out to 10x30in. Now cut the dough into 9 triangles. Each triangle should be about 5 inches at the wide end and about 1 inch at the narrow end. I like to make a small slit in the middle of the wider ends so the croissant folds nicer. However, that’s totally optional. Fill the wider end of the triangles with 1 heaping tablespoon of the almond paste. Then roll the triangles toward the narrow end as you slightly pull the pointed end away. Place the croissants onto a baking sheet lined with parchment paper and let them rise in room temperature for 1-2 hours or until they double in size. 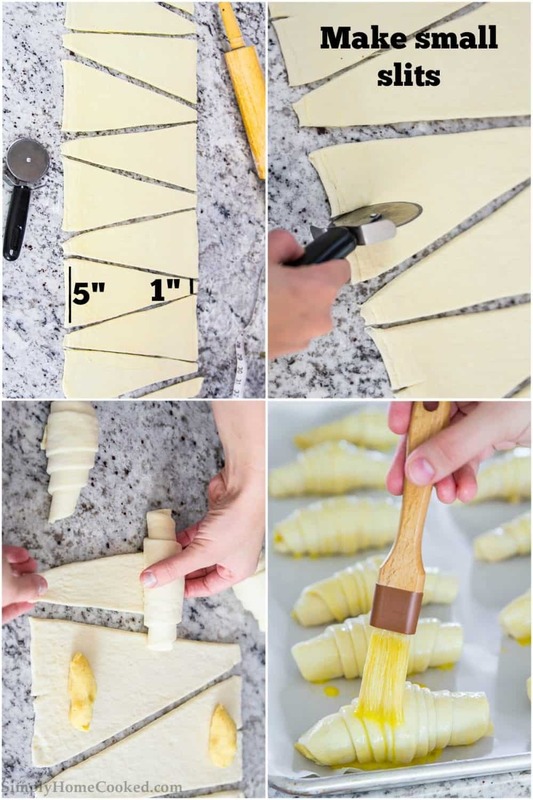 Using a pastry brush, brush each almond croissant with egg wash and bake at 390 degrees Fahrenheit for 10 minutes, then 370 degrees Fahrenheit for 15 minutes. Baking time may vary depending on your oven. 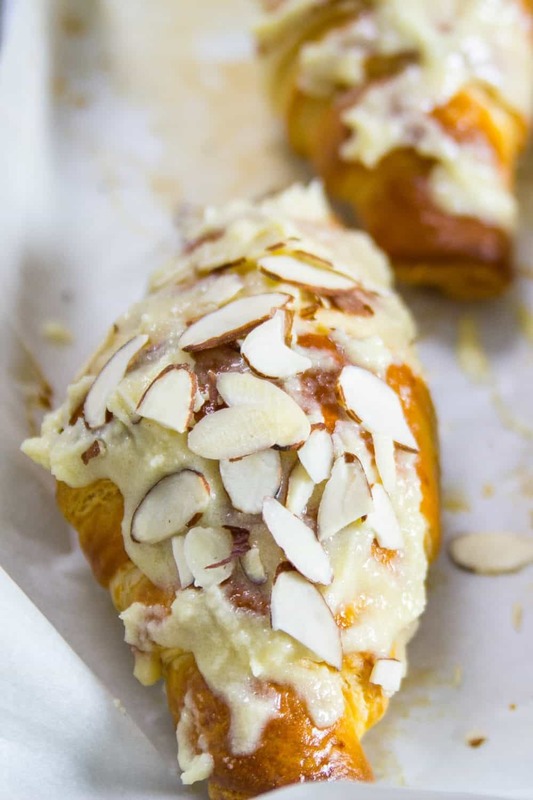 Mix the leftover almond paste with a splash of milk and spread it over each almond croissant. 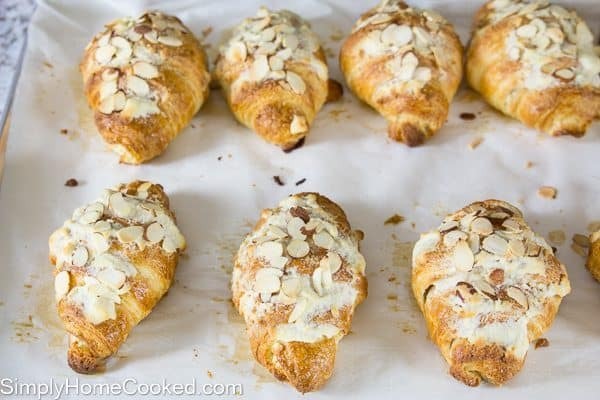 Sprinkle sliced almonds over each croissant and bake for another 5 minutes at 370 degrees Fahrenheit. Once their cooled, dust powdered sugar over the top of each almond croissant. 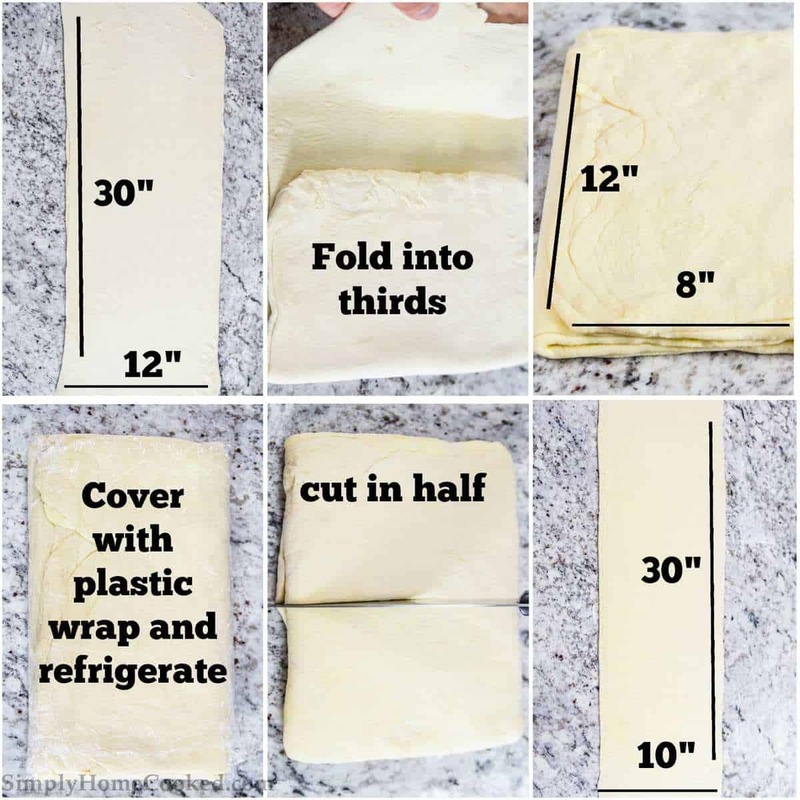 Remove the second half of the dough from the refrigerator and roll it out to a 30×10 inch rectangle. Cut out 9 triangles and repeat this process with the remaining dough. Disclaimer: This post contains affiliate links. This means we make a small percentage when you click & shop. Your cost is the same. We only recommend things we use and truly love. In a bowl or medium measuring cup, combine the water and yeast. Let it sit in a warm place for 10-15 minutes or until the yeast dissolves. 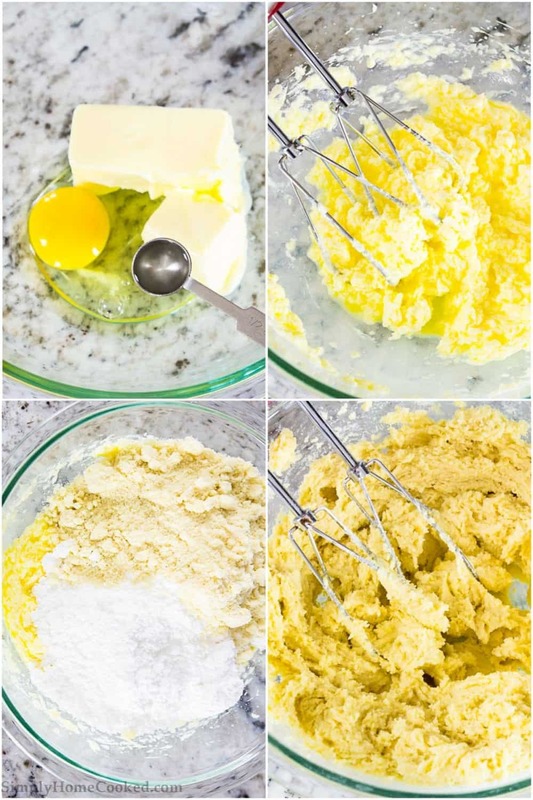 In the bowl of a stand mixer, combine the flour, sugar, and salt. Then pour in the warm yeast water. Using the hook attachment, mix the dough on medium speed until it begins to take shape. Toss in 1/2 cup of softened butter and continue mixing on medium high speed until the dough is smooth and well rounded. Transfer the dough into a bowl greased with oil. Lightly grease the dough with oil as well. Cover with plastic wrap and let it rise for 2 hours or until it triples in size. Meanwhile prepare the butter slab. Start by cutting out 2 large sheets of parchment paper. Trace an 8x12 inch rectangle on each sheet. Place 1 1/2 cups (3 sticks) sliced butter in the middle of one sheet. Have the traced side down (you don't want to get any pencil marks on the butter). Place the second sheet on top (traced side up). Using a rolling pin, roll out the butter to the edges of the traced rectangle. Then place on a flat surface in the refrigerator. Once the dough is done rising, deflate it onto a floured surface and roll it out to a 28x14 inch rectangle. Fold over 2/3 of the left corner then bring in the right corner so it covers the other edge but doesn't quite reach the other side. Starting from the shorter edge fold the dough into thirds. Cover with plastic wrap and refrigerate for 6-8 hours (or overnight). In a bowl, combine 1 egg, 3/4 cup butter, and 1/2 tsp almond extract. Then blend in the 2 1/2 cups almond flour, 1 1/2 cups powdered sugar, and 1 tsp corn starch. This will be the almond paste. Gently deflate the dough onto a floured surface and roll it out to a 25 x 9 inch rectangle. Place the chilled butter slab on the right half of the dough leaving at least 1 inch margin around the edges. 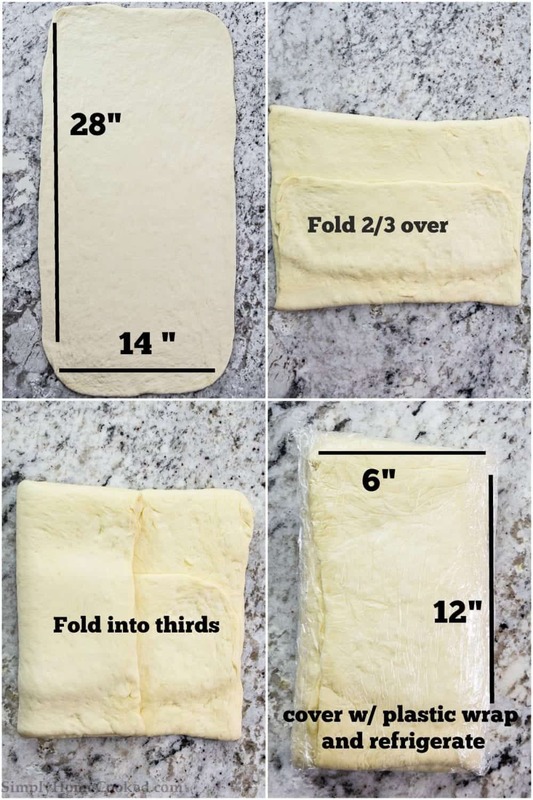 Fold over the left (unbuttered) half and roll the dough out to a 30x12 inch rectangle. It helps to spread the butter by pressing down with the rolling pin along with rolling it out. Roll the dough out to a 30x12 inch rectangle. Fold it in half like a book. Once its folded in half the dimensions should be 15 x 12 inches. Roll it out to 30 x 12 again. Then fold it into thirds. If the butter begins to melt, cover with plastic wrap and refrigerate for 30 minutes. The size of the dough should be 12 x 8 inches before wrapping it in plastic wrap. Cut the chilled dough in half. Rewrap 1 halve and place it back in the refrigerator for later use. Roll the unwrapped dough into a 30x10 inch rectangle and cut out 9 triangles. Each triangle should be about 5 inches at the wide end, and about 1 inch at the narrow end. I like to make small slit in the middle of the wider ends so the croissant folds nicer, but thats totally optional. Fill the wider end of the triangles with 1 heaping tablespoon of the almond paste. Then roll the triangles toward the narrow end as you slightly pull the pointed end away. Place the croissants onto a baking sheet lined with parchment paper and let them rise in room temperature for 1-2 hours or until they double in size. Do not put them in a warm place to speed up the rising process. You don't want the butter to melt. Brush each croissant with egg wash and bake at 390 degrees Fahrenheit for 10 minutes, then 370 degrees Fahrenheit for 15 minutes. Baking time may vary depending on your oven. 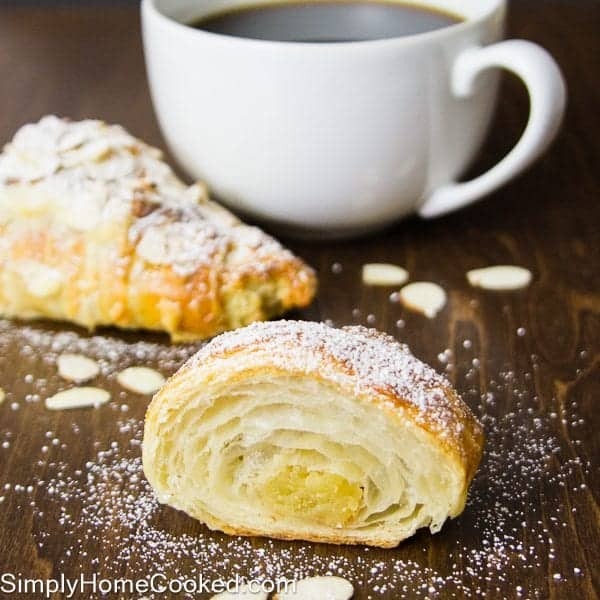 Mix the left over almond paste with a splash of milk and spread it over each croissant. Sprinkle sliced almonds over each croissant and bake for another 5 minutes at 370 degrees Fahrenheit. Once their cooled, dust powdered sugar over the top of each croissant. Remove the second half of the dough from the refrigerator and roll it out to a 30x10 inch rectangle. Cut out 9 triangles and repeat steps 14-17. 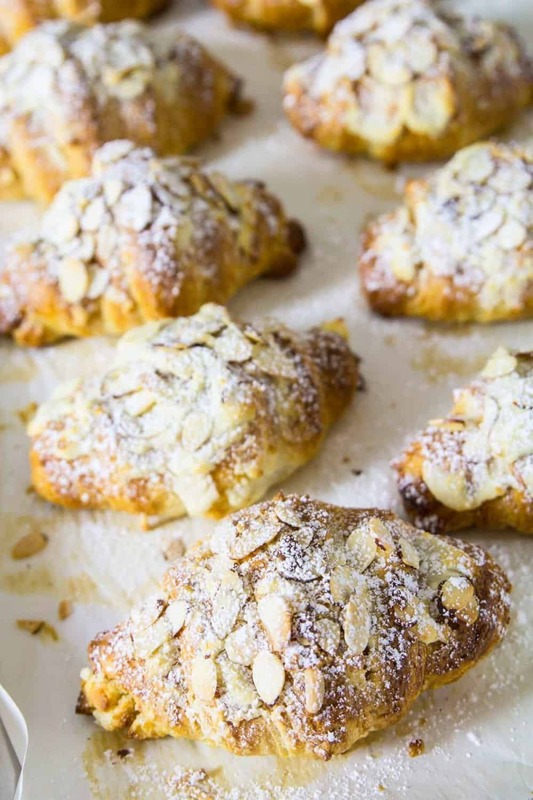 PS: We’ve updated some of the photos in this almond croissant recipe. Here are our older photos. I was so happy when I managed to do this recipe on my first go! It was fun (albeit a lot of work), and the croissants tasted great. Definitely cooking it again – though I was a bit generous with the filling on the first go, which meant I could only eat one at a time (this is probably a good thing)! Hi, just wondering how many layers these croissants have? Hi Sylvia, I’m not too sure, but typically croissants should have about 27 layers. I am excited to try these! They look delicious! Could I refrigerate the dough for a full 24 hours? Will that affect it at all? Hi Sarah, you can refrigerate it for a max of 24 hours. Try not to leave it any longer because the dough might rise too much. Almond flour is abit pricy this side, can normal flour and abit of grinded almonds be added instead? Love, love this recipe, I can’t wait to make it again. Turned out beautifully. I used salt free butter, with no problem. Thank you Kathrine. I’m glad you enjoyed the almond croissants! These look delicious. Can’t wait to make them. Croissants are a lot of work, I’m so sorry to hear they didn’t turn out. The only reasons I can think of for why they turned out so hard is that they didn’t rise properly, or they were maybe over baked? I made these this weekend. I have been looking for a full recipe for a long time so I appreciate the post…my, a labor of love…love the favor and came out flakey. My problem was that in about half the croissants the filling came out and had a buttery mess. Yes I waited for doubling in size after creating the croissant. I also used the recommended amount of yeast. I think maybe an almond paste made without butter would help in the buttery mess but not sure how to keep the filling from squeezing out. The croissants after baking did double again so actual almost quadrupled in size. On the upside, the messy filling did taste wonderful…better than a cookie. 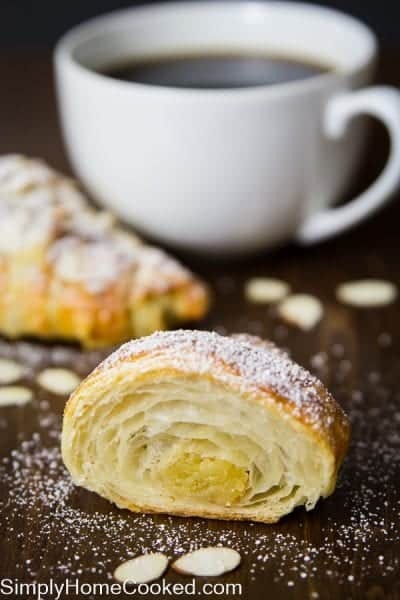 Hi Connie, I’m so glad to hear that you enjoyed the taste of these croissants! Hmm the only reason I think the almond paste leaked out is maybe because they weren’t sealed will enough? Hey There! Thanks for the recipe! Do you recommend using European style butter? I thought the extra fat content would help make them even more tasty. Also—what is a splash of milk in your recipe defined as…? Hi Ben, I’m not too sure European butter will change anything. I’ll have to try that. When I mention a splash I mean about 1-2 tablespoons. I would start with about 1 tbsp and keep adding little by little until you have the right consistency. Hope that helps! Made these for breakfast this morning (started the process yesterday). They turned out wonderfully layered and flakey. 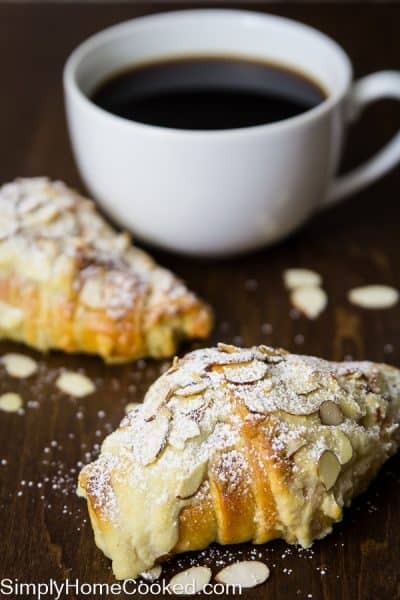 I love almond croissants and was happy to find a recipe that wasn’t just taking purchased croissants and adding almond paste. How ’bout making these recipe printable so we can save for later! Hi Kevin, if you scroll to the bottom of the recipe, there is a printable version of the recipe. These were absolutely to DIE FOR!! Thank you so much for treating us! You’re so welcome Anna! Glad you all enjoyed the croissants. Can these be frozen before baking? Hi Carla, I’ve never frozen them before baking, but I’ve heard of people doing it. I can’t say much since I’ve never tried it. Next time I make a batch I’ll try freezing a few croissants and let you know how they turn out. Hey, curiously. Did you end up finding out whether you can freeze them before baking? Hi Kurt, I actually did some more experimenting and found that freezing them before the last proof worked out very well. If you go to the short summary at the beginning of the recipe, I have a detailed description on how to go above freezing the croissants. Thank you for sharing this recipe! In Minneapolis there was a French bakery that had croissants. They had plain or chocolate filled – the chocolate filled were delicious. There’s a bakery in upstate New York that has bread and inside the put chocolate chunks Pain au Chocolate. You’re so welcome Caroline! Chocolate croissants sound so delightful! Thank you for this recipe. It’s first crossant recipe I’ve seen which seems remotely do-able! The one bit that seems tricky to me is the cutting & measuring of the triangles. Could you please explain how you did that part? Much appreciated. Also don’t suppose you could list ingredients by their weight?